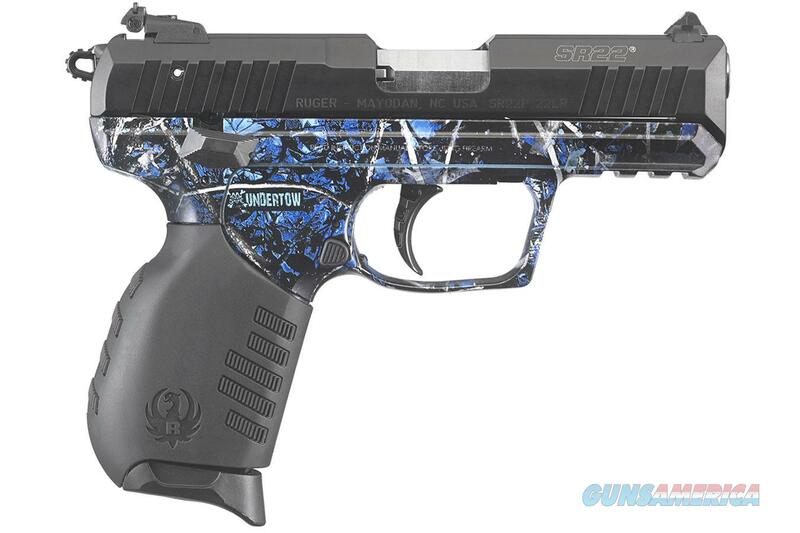 Ruger has put a new twist on the SR22, now with a Moonshine Camo Undertow finish. The SR22 is a rugged, scaled-down version of a full-sized pistol, perfect for plinking, target shooting and small game hunting. The lightweight SR22 has modern styling and is fun to shoot while using inexpensive rimfire ammunition. The SR22 has light double-action and crisp single-action trigger pulls. Its external hammer is designed with a rounded spur for easy cocking and single-action shooting. The SR22 features a polymer frame and two interchangeable (no tools required) rubberized grips with angled serrations, allowing shooters to select either a slim or wider palm swell option. The aerospace-grade aluminum slide has serrations on both front and rear for better grip and slide manipulation. The easy-to-use underside Picatinny rail features multiple cross slots for variable mounting of most popular accessories. - Light double-action and crisp single-action trigger pulls. External hammer is designed with a rounded spur for easy cocking and single-action shooting. - The aerospace-grade aluminum slide has serrations on both front and rear for better grip and slide manipulation. - The easy-to-use underside Picatinny-style rail features multiple cross slots for variable mounting of most popular accessories. - The dovetailed, high-visibility three-dot sight system has a fixed front sight and a rear sight that is both windage and elevation adjustable. A reversible blade allows shooters to select two white dots or a solid black blade. - Other SR22® features include a stainless steel replaceable barrel, an ambidextrous manual thumb safety/decocking lever, ambidextrous magazine release, plus a visual inspection port allows for visual confirmation of a loaded or empty chamber. - Includes two finger grip extension floorplates that can be added to the magazine for comfort and grip.